On 12 April 2002, NASA's Jet Propulsion Laboratory reported that new images taken by the Advanced Spaceborne Thermal Emission and Reflection Radiometer (Aster) on NASA's Terra satellite showed signs of activity at Chiliques. This volcano was previously considered to be dormant; however, on 6 January, a nighttime thermal infrared image from Aster showed a hot spot in the summit crater, as well as several others along the upper flanks, indicating new volcanic activity (figure 1). Examination of an earlier nighttime thermal infrared image from 24 May 2000 showed no such hot spots. Figure 1. Aster images of Chiliques. The larger view is a daytime image acquired on 19 November 2000, created by displaying ASTER bands 1, 2, and 3. The inset is a nighttime thermal infrared image of Chiliques on 6 January 2002. Both images cover an area of 7.5 x 7.5 km and are centered at 23.6°S latitude, 67.6°W longitude. Courtesy Michael Abrams, NASA's Jet Propulsion Laboratory. General Reference. de Silva, S.L., and Francis, P.W., 1991, Volcanoes of the Central Andes: Berlin: Springer-Verlag, 216 p.
Information Contacts: Michael Abrams, Jet Propulsion Laboratory, California Institute of Technology, National Aeronautics and Space Administration, Pasadena, CA 91109 (URL: http://www.jpl.nasa.gov/). The Global Volcanism Program has no Weekly Reports available for Chiliques. The Global Volcanism Program has no synonyms or subfeatures listed for Chiliques. Volcán Chiliques is a structurally simple stratovolcano located immediately south of Laguna Lejía. The summit contains a 500-m-wide crater. Several youthful lava flows, some of which are considered to be of possible Holocene age (de Silva, 2007 pers. comm. ), descend its flanks. The largest of these extends 5 km NW. Older lava flows reach up to 10 km from the summit on the N flank. This volcano had previously been considered to be dormant; however, in 2002 a NASA nighttime thermal infrared satellite image from the Advanced Spaceborne Thermal Emission and Reflection Radiometer (ASTER) showed low-level hot spots in the summit crater and upper flanks. de Silva S L, 2007. (pers. comm.). de Silva S L, Francis P W, 1991. 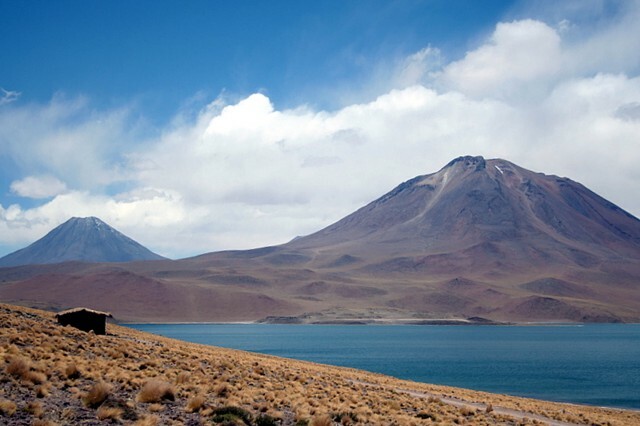 Volcanoes of the Central Andes. Berlin: Springer-Verlag, 216 p.
The Global Volcanism Program is not aware of any Holocene eruptions from Chiliques. If this volcano has had large eruptions (VEI >= 4) prior to 10,000 years ago, information might be found on the Chiliques page in the LaMEVE (Large Magnitude Explosive Volcanic Eruptions) database, a part of the Volcano Global Risk Identification and Analysis Project (VOGRIPA). There is no Deformation History data available for Chiliques. There is no Emissions History data available for Chiliques. Volcán Chiliques, the conical peak at the left, is a structurally simple stratovolcano located immediately south of Laguna Lejía. A 500-m-wide snow-capped crater truncates the summit and contains a small lake. 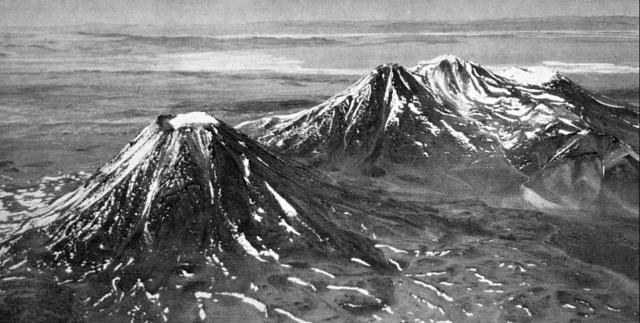 The volcano was constructed over a base of dacitic lava domes and andesitic lava flows. Youthful lava flows radially descended from the summit as far as 5 km to the NW. The volcanic complex at the right is the Pleistocene Volcán Lejía, which was constructed within a 3.5-km-wide caldera. Photo by Instituto Geográfico Militar, courtesy of Oscar González-Ferrán (University of Chile). An ASTER satellite image from NASA in November 2000 looks down onto the summit crater of Chilques volcano. Radial gullies descend the flank of the volcano. Nighttime thermal infrared images on April 12, 2002 revealed hot spots in the summit crater and along the upper flanks, marking the first observations of historical activity at the volcano. Photo courtesy of National Aeronautical and Space Administration (NASA), 2000. 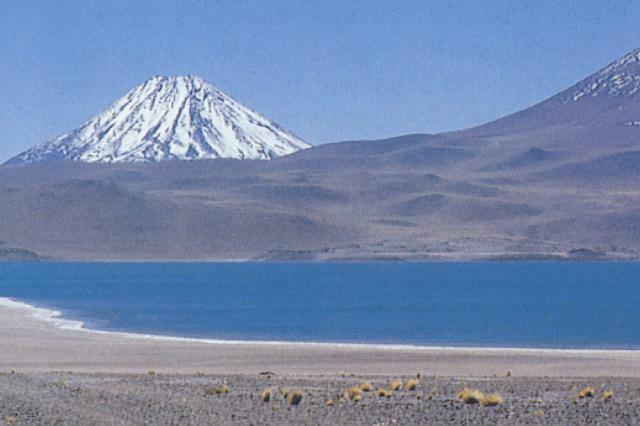 Snow-capped Volcán Chiliques is a conical stratovolcano located NNE of Laguna Miscanti (foreground). The 5778-m-high summit of the volcano contains a 500-m-wide crater. Several youthful lava flows, some of which are considered to be of Holocene age descend its flanks. Chiliques had previously been considered to be dormant; however, in 2002 a NASA nighttime thermal infrared satellite image showed low-level hot spots in the summit crater and upper flanks. Photo by Carlos Felipe Ramírez (courtesy of Oscar González-Ferrán, University of Chile). Conical Volcán Chiliques (left) and Volcan Miscanti (right) rise to the NE above Laguna Miscanti. The 5778-m-high summit of Chiliques contains a 500-m-wide crater, and some youthful lava flows may be of Holocene age. 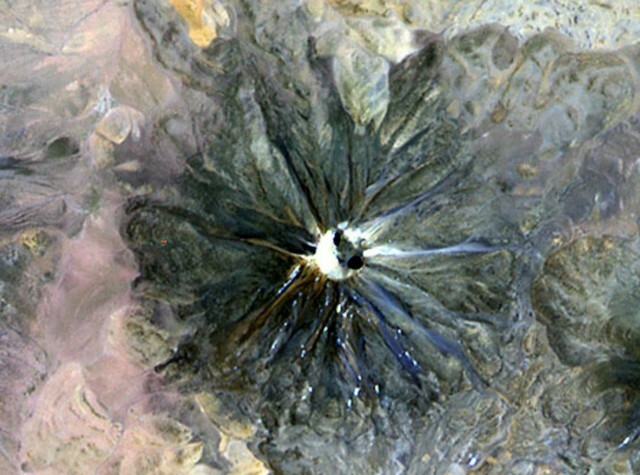 This volcano had previously been considered to be dormant; however, in 2002 a NASA nighttime thermal infrared ASTER satellite image showed low-level hot spots in the summit crater and upper flanks. Miscanti volcano is of probable late-Pleistocene age. Photo by Jos Offermans, 2008. There are no samples for Chiliques in the Smithsonian's NMNH Department of Mineral Sciences Rock and Ore collection. Large Eruptions of Chiliques Information about large Quaternary eruptions (VEI >= 4) is cataloged in the Large Magnitude Explosive Volcanic Eruptions (LaMEVE) database of the Volcano Global Risk Identification and Analysis Project (VOGRIPA).